How is Liz going to prove that he is a hero if no one will give him a chance? Liz needs to find a way! Episode Theme: All kingdom tasks are valuable, no matter the size. 1. In 1 Samuel 30:24, David is talking about the roles of soldiers in his army. Why do you think those who only watched the supplies received as much reward as those who fought and won the battle? 2. When King David and his army returned from a series of battles, they discovered that their homes had been raided (1 Samuel 30:1-25). Their families and all that they owned had been taken away. David and his men set off to catch the robbers. But 200 of the men were too tired to go on. David told them to stay with the supplies while he, and the rest of the soldiers, continued on. They found the enemy and fought a long battle. David’s army was able to rescue all the families and get back all the stuff. When they returned to where the 200 men were watching the supplies, David offered those men an equal share in the plunder. The men who had fought were angry because they’d done all the work. But David explained that the credit for their victory should go to the Lord. He said that all who played a role, no matter how small, would be rewarded. Think about what it means to be faithful in small things as you listen to today’s story. In this episode, Liz had to learn that all jobs are important when they’re done for the Lord. The Bible is full of histories of men and women who did amazing things. But the Lord makes it clear that all of them were rewarded for their faith—not for what they did. They trusted God, and that is what made them successful. In Colossians 3:17, the apostle Paul writes that whatever we do, no matter how small, should be done for the Lord. Later, in the same chapter (verse 23), he says that we should do everything as though we were working for the Lord. Want to dig deeper into God’s Word to learn about living by faith? Read Hebrews 11:7; Hebrews 11:8 and Hebrews 11:24-27. Name the rap-talking lizard that Liz and the kids meet. Name the leader of all the relief workers. What did Chamy find attached to Liz’s travel bag? God has a plan and takes care of His creation. Download and listen! Let's give each other some grace! Check out this song about loving my neighbor. Download this fun Christmas Card. Color the Kids Corner characters. Merry Christmas! Share the love of Christ with your friends, family and neighbors. Happy Valentine's Day! Check out this song about forgiving and kindness! It's a Kids Corner original from a long time ago and not from the famous movie. Download this song about giving respect! With a little change in our own attitudes, we see people the way Christ sees them. Download this coloring book illustrating some of the fun adventures of Liz and all the gang! It’s more than talk. It’s the way you walk. Listen to this story of a man whose life was shaped by God for great things. What was it like the day that the Holy Spirit came? God fulfilled a great promise. The story of Ruth and Naomi shows God’s faithfulness to his people. Liz and Spike are at war with Teddy when he ruins their entry in the school Science Exposition. How will it stop—with more revenge? Or with forgiveness? Lacey's family have got it tough, and Lacey's has to learn about life without a phone...and her friends. What can Lucille do to be a friend? Skink the bully mocks a new kid's appearance. See how Liz and gang stand together to frustrate Skink's plans. Grandpa challenges Liz and Lucille to be a peacemakers. Who's got the bigger test? Liz with Spike and Skink? Or Lucille with Mrs. Trollscales! For Liz, what is the most important ingredient for success? Is it skill, knowledge or teamwork? Morrie's parents are acting weird. What did Liz overhear? How will Morrie's life change forever? Julia thought she and Lucille were best friends forever, so why has Lucille been ignoring her lately? An extended absence from school puts Lucille on the outside of the circle of girls in her class. She gets picked on and finds that Jesus is a true friend even when others abandoned her. The school computers have been stolen, and Liz is on the case … but unfortunately so is Skink. Can they work together to find the thieves and return the computers? Super cool news! 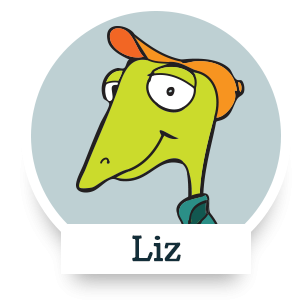 Liz and his friends are flying off to Luxurious Lizard Lagoon—that is, if the plane ever takes off. Why do games always have to have rules? Help Liz and Grandpa figure out what's right about rules! Don't Judge A Book . . .
Yikes! What happens when Liz and Lucille try to return a lunch box that belongs to someone in the weirdest family in town? Liz judges people based on appearances and names. So he's real trouble when he meets Terrene's newest dentist, Dr. Pain. Liz is feeling like a total failure because everything is going wrong, but Lucille has the perfect solution. Liz and Morrie decide to find Scooter on their own. Do they find him or get lost too? Liz and his friends decide to use their free time to collect food for the community shelter. But a grumpy neighbor and a troublemaking classmate try to derail their plans. 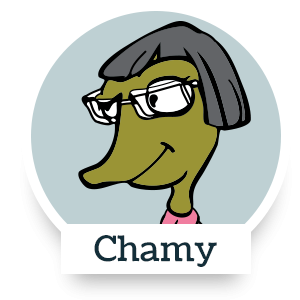 What’s wrong with Chamy? Why is she crying? Lucille finds out and learns a lesson about being a friend. Also, a special treat: the KC song “Leap of Faith”! Liz has lost his phone, and now someone is using it to send strange text messages to his friends. What can he do? Liz is kicked out of baseball camp. How will this help him honor his father? Liz and Cole are in charge of the school for an entire day! Liz needs help to stop gossip from destroying a friendship. Let's work together! The Lizarardo Detective Agency needs your help to solve the mystery of the missing comic book. Random Acts of Kindness are breaking out all over. Who's doing it? And how can Liz discover how to be kind—even when it’s hard. While waiting for the rescue, Liz and the gang remember times when they were mean to Scooter. Will they choose to be nicer when he is found? Terrene’s power has gone out. No television, no X-monsters gaming, and no community fundraising dinner. When the kids complain that there’s nothing to do, Granny sends them on an adventure to Falcon’s Wood. What’s Scooter worried about? And Liz better watch where he’s going! Does God really expect us to love our enemies? What happens when Miss Wattle gives Liz the task of warning Skink to improve his grades? 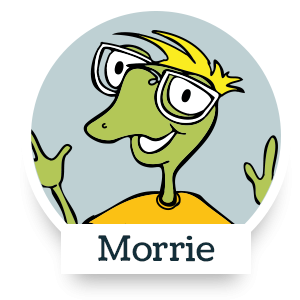 There’s a new girl at school, and Liz, Spike, and Morrie each want to take her to the dance. Will their friendship survive? What are the best ways to show Jesus's love? Liz decides to a great thing for God, while Lucille soon discovers an unexpected place for a mission trip. Scooter’s hero, airplane ace Lonesome Chuckwalla, crash lands into Grandpa’s barn in a storm. And that's just the start of the problems! Liz’s band is going to play for Youth Fest—unless all their arguing destroys the band first! Liz’s pastor challenges him to go out and love an enemy. Can Liz and his friends really love someone like the Good Samaritan did? What does a true friend look like? Lucille is trying to figure out "friendship". Liz and Lucille try to be friends with Gerard the new kid in town. But Gerard seems to prefers the Iguana gang! Can Liz help Gerard before his new friends get him into trouble? Morrie gets up the courage to talk to the little red-headed girl he’s had a crush on. But does she like him, or is there someone else? A famous scientist has come to Reptarium Middle School to teach, but none of the kids can figure out what’s happening in the classroom. How will the gang respectfully talk to a teacher when he is the problem? Skink and Cole are going to fight! What’s this all about anyway? And why is Liz so happy about it? Space Troopers Liz Laserlight and Spike Starrunner have 17 minutes to save the planet Zot from destruction. Can their words and actions convince the Noobles and the Nerbles not to use their secret weapons? Spike may have found a new friend, but there’s one condition: Spike has to sabotage Scooter’s skateboard. LizRadio listeners want new music on WLZR. What's Liz's new plan and who can help? Chamy unveils her latest invention. Introducing the Positronic Affirmation Transmitter! Will it solve Chamy’s latest problem? And how exactly does it mess up Liz’s batting practice? Liz decides to start an internet radio station. But he doesn’t want any help from his friends. Soon he finds out that running things alone isn’t all it’s cracked up to be. What does it take to make a new friend? Liz, Morrie, and Lucille take on this challenge with some surprising results! Knock, Knock! Who’s there? Spike knows all the good jokes, and the KC gang wants to put him on the stage at the Talent show. But when Spike switches things up, he has to learn a lesson about what really is funny. Everything is going wrong for Liz this summer, and he can’t figure out how to fix his summer blues. While on a camping adventure, Liz and the gang must face their own fears of braving the wilderness. Are those “things that go bump in the night” a bear, an owl,or some pranking friends? Who will win the battle of bravery, and who’s a scaredy-cat? Do you know a family that’s been changed by a divorce? 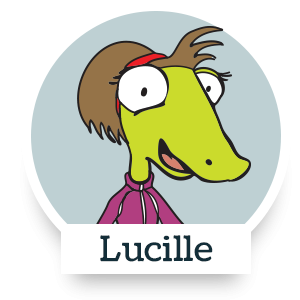 Join Lucille as she worries and wonders about her family on this episode of Kids Corner. Liz has an amazing opportunity to meet a famous rock star—unless his pride gets in his way! Scooter hides on the bus so he can go on the 5th-grade camping trip. He’s discovered too late to send him home. But in the morning, Scooter is missing! Liz discovers a superhero in an unexpected place. Who is this hero and where did that lizard come from? Do Liz and Spike have what it takes to make the school team? Liz's class joins with another class, and soon Liz learns a lesson about celebrating abilities. Liz gets the band together to play a new song he's written. But what's getting in the way and ruining everything? Liz and the gang’s soccer team face fierce opponents when they play the Lagarto City Junior Dragons. Gaby Tegu joins Liz’s team. Whose side is she on anyway? Grandpa is acting really strange. One day he's really crabby, and the next day he's nice. What's going on? Liz is a contestant on a TV game show, and he’s positive he will win! When Miss Manners comes to town for a reality show about manners the kids all try to win the contest. But the winner is a surprise for everyone. Who Needs A Best Friend? Who is your best friend? What’s the best part about being best friends? Help Liz figure out how to be a best friend on this week’s Kids Corner. On a camping trip, Liz and the gang must learn to work together to survive in the wilderness and to rescue a friend!